My often-bragged-about, love-of-my-lifetime husband has only given me flowers once. Once in 24 years of knowing him. The once came randomly after about 6 months of knowing each other. More on that later. Thankfully my love language is not gifts. In fact, that love language is barely on my radar. Thankfully my dear husband does fill up my car with gas, does do all of the grocery shopping, and nearly always takes out the garbage (as of late). I consider this romantic. Of course, my love language is acts of service. I know there are men and women out there who love doing the grand gestures. They particularly love doing the grand gestures for first dates. I don’t know if they are in love with the actual planning part, the expressions on the date’s face part, or if they are so in love with feeling like they are in love. 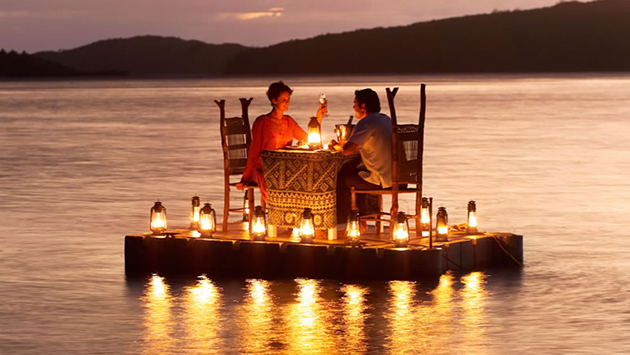 Grand gestures on first dates make wonderful memories. Give you wonderful stories. But they do not make a relationship. I do believe you are going on that date in the hopes that there may be a relationship. Grand gestures start your story together off on the wrong path. Often an unsustainable path. Why? Your goal on these first dates is to impress each other and to connect with each other. Grand gestures just impress. Yes, it is a good impression. Hopefully it is who you are to the core. But first make the connection. Create your first date plans all around the connection. That means food somehow because we all connect over food. This does not mean you plan a picnic on that one spot by the waterfall that you have to hike 30 minutes to get into. This does not mean you pick the most romantic restaurant in town. This does mean you pick a restaurant that is quiet and comfortable so the two of you can talk and hear each other. Yes, this is not so romantic. This does not make for a great first date story. But it will help you get that next date because a connection was made. Then some time later you can take that hike to that waterfall spot and impress her with your romantic ingenuity. Won’t your date be beautifully surprised? And impressed? Besides if you make a practice of first date grand gestures soon you are going to have to repeat your grand gesture ideas and no one wants to be that fifth date going with you on that hike and picnic to that spot by the waterfall. When this relationship is growing into something, when your discerner (part brain, part instinct, part Holy Spirit) is letting you know that this may be a good match, when you are learning a lot about yourself, then try some grand gestures. Then try adding to your story with these romantic things. This path is sustainable. And also probably more affordable. Hence why I got flowers around 6 months after I met John. I didn’t get them because someone died or because I was sick. He just sent them because he was giddily happy with our relationship. Sweet, right? Except he never sent flowers again. Was that because he was no longer giddily happy? No way. That has never changed. He will tell you that he just didn’t understand the expense of it to match the purpose of it. His love language is not gifts either. His grand gestures were acts of service and he eventually wore me down and I married him. How did he know to amp up the grand gestures of acts of service? He doesn’t even know except he was praying like crazy that I would end up with him. His discerner was working well! Let’s take the daydreaming down a notch and stop expecting the romantic grand gestures at the beginning of a dating relationship. Let’s save the romantic adventures and stories for the “middle” part of dating. Won’t that be a fun story to tell again and again and again? Because the two of you are already connected to be building such a story together. Read also: Who Was That Person On That Date?